The Chuck Taylor basketball shoe is as American and classic as apple pie. The news was particularly painful for anyone who has ever considered black high-tops a way of life. ESPN.com reported last week Converse is in serious danger of going under because of an ocean of debt, meaning the Chuck Taylor All Star basketball shoe is in danger as well. What’s next on the endangered list, mom or apple pie? Company officials were quick to issue a news release saying Converse is looking forward to a long and healthy life, and would everyone please throw out the obituaries? Consider this a celebration of a life well-lived and a shoe well-worn then. Chuck Taylor’s story is one that could never happen again in this country, not with greed and selfishness the unofficial national pastimes, not with innocence a faded concept. It’s a story worth telling one more time. In 1921 Taylor began working for Converse after somehow talking his way onto the company’s staff. He had grown up outside of Columbus, Ind., had been a high school basketball star and had played for barnstorming teams such as the Buffalo Germans and the Akron Firestones. It wasn’t much of a resume. Two years later, after Taylor consulted with several coaches about what they were looking for in a basketball shoe, Converse put out the Chuck Taylor All Star. The shoe didn’t look much different from the way it would later: an ankle-covering canvas upper, a star and Chuck Taylor’s signature. Taylor spent the rest of his life as the Johnny Appleseed of Converse products, planting his shoe wherever he happened to be. For most of his adult life he traveled the country in a Cadillac and lived in hotel rooms year-round. He didn’t own a home or even rent an apartment until he was in his early 60s. He kept his belongings in a Converse warehouse in Melrose Park. And he sold his shoe. 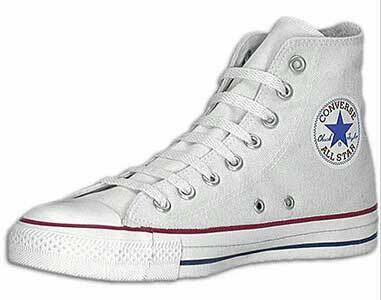 During the 1960s Converse sold 10 million Chuck Taylor All Stars a year. Imagine that. Imagine a star in this era of shoe contracts not getting something for the use of his name on a product. He’d show up in a town unannounced, beige baseball cap on his head, pipe in his mouth. He would walk to the nearest sporting goods store, not tell customers who he was and talk about his product. He would go to local high schools and give basketball clinics. He met his future wife (where else) at an NCAA tournament game. He was 60 and figured it was time to settle down. He died in 1969, a year after he was inducted into the Basketball Hall of Fame. He was 68. For the rest of America, he was the name on the shoe. Most of us didn’t have the vaguest idea who he was. A coach, maybe? All we knew was if you played basketball, you wanted his shoe. If you made the high school team at many schools, you received free Chuck Taylors. It didn’t get much better than that. You lived by certain rules. You tried to keep the white high-tops as clean as you could for as long as you could. You didn’t dare put Chuck Taylors in a washing machine because it would weaken the canvas. In 1966 chuck went funk. What had been available in either black or white suddenly became the rainbow coalition of basketball shoes. Over the years I have had black, white, green, orange, gold, red, maroon and blue Chuck Taylors. I bought my first pair of Nikes in 1978, during my senior year of high school. I felt like I was cheating on a girlfriend, not that I had one. But the Nikes looked pretty cool, and they felt better too. Canvas forever would be for painting, not for basketball shoes, and Converse couldn’t keep up with the Nikes and the Reeboks of the new world. And now we are here on the edge, we and Converse, according to an Internet report. For generations of basketball players, the idea that Chuck Taylors could be in danger of extinction is another uninvited reminder that we’re all getting older and older. Of course, the fact that a Hubble Space Telescope is needed to discern some of our vertical leaps would seem to be a good clue too. Is there room for Chuck Taylor All Stars in this world anymore? I don’t know. I know there’s room for a shoe salesman’s story.